Well…. I’ve been extremely lazy this month, so I’m making up for it with three (mini) reviews and a Fistful of Recipes! 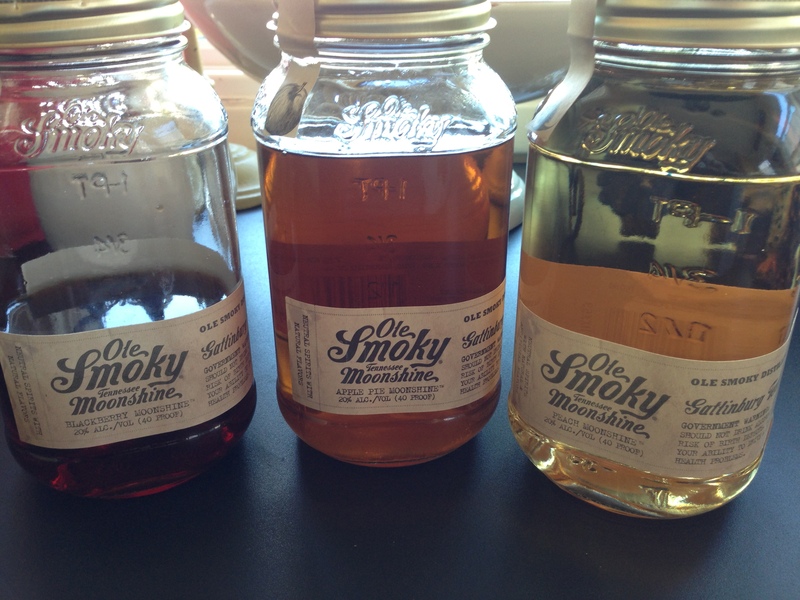 So, Ole Smoky is a distillery out in Tennessee that cranks out flavored liquors, drunk cherries, and two unflavored versions of “moonshine.” I put moonshine in quotes there because if this stuff were real moonshine, it wouldn’t have a website and wouldn’t be sold in my local liquor store. I’ll let you go look up the history of moonshine on your own. What I’m reviewing today are not varieties of moonshine at all. They’re liqueurs. As you’ll note in the picture, I have Blackberry, Apple Pie and Peach at fingertips to review. I’m calling them liqueurs and not moonshine because they’re all just 20% alcohol by volume. That’s a mere 5% stronger than some wines I’ve had. Not that it’s a bad thing. At this low proof, they are perfect for mixing! “I love peaches. Ok, that’s a lie. I like peaches. Let me start off by saying, they’re all good. I have my own fave, which does not line up with the wifey’s favorite. But they’re all good. You’ve heard me talk about the Blackberry Moonshine before as it’s an ingredient in my now-famous Black Bourbon cocktail. (Go check the link. It’s a tasty treat.) The thing about berries is that they’re not particularly sweet. Everyone tends to think they are, but they’re not really. And Blackberry Ole Smoky isn’t overly sweet either. It’s a refreshing twist, and one not followed often. But it does mean that the Blackberry is a great mixer. Add ice to a Boston Shaker. Add the gin & Ole Smoky to the shaker. Shake until your hands feel like they’re going to freeze off; then shake for another 10 seconds. Not even kidding you: it tastes like apple pie. Not just like apples, but like apples and cinnamon and salt and brown sugar… all that awesome stuff. This one is sweet. Not cloyingly so, but sweet. But the spices in it really take it up a notch or two. It seems so cliche but the best use for this stuff that I’ve found is in mulled apple cider. Mull your cider in your preferred method, but make sure that you have a good 2 quarts of the stuff. When it’s done, dump in the whole jar of Apple Pie Ole Smoky. Let it heat back up. Sip and enjoy a nice night in! Boozeguru Buddy Dan has peach infused bourbon. Mix that with the Peach Ole Smoky and you’ve got a lovely nightcap! For your mixing enjoyment, try these guys. They’re all tasty.